DES MOINES – The Iowa Barnstormers and the Indoor Football League (IFL) are pleased to announce their 2019 season schedule. The Barnstormers will open the season with a bye week before hitting the road to take on the Quad City Steamwheelers Sunday, March 3, 2019. The team will return to Des Moines for their home opener against the Green Bay Blizzard on Saturday, March 9, 2019. The 2019 IFL season marks the league’s 11th season of play and will feature a 14 regular-season game schedule. The league is also welcoming four new member teams this season with the addition of the Bismarck Bucks, Quad City Steamwheelers, San Diego Strike Force, and the Tucson Sugar Skulls. The Barnstormers 2019 home schedule will consist of seven total home games and will kick-off with a matchup versus the Green Bay Blizzard on Saturday, March 9. The home schedule also hosts the Cedar Rapids River Kings (April 6 and May 4), Quad City Steamwheelers (May 11), Bismarck Bucks (May 24), Sioux Falls Storm (June 8), and Nebraska Danger (June 15). The 2019 season brings new challenges for the Barnstormers as they fight to defend the title of United Bowl Champions. The team’s schedule will feature new opponents and old rivalries. 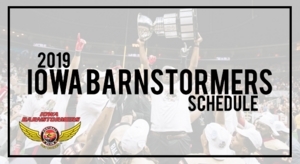 The Barnstormers will be traveling a total of seven times in 2019, kicking off the season on the road against the newly joined Quad City Steamwheelers on Sunday, March 9. The Barnstormers and Steamwheelers have history and look forward to reigniting an old rivalry. The season also includes travel to the Nebraska Danger (March 23), Cedar Rapids River Kings (March 30), Bismarck Bucks (April 14), Sioux Falls Storm (April 20), Tucson Sugar Skulls (April 27), and Green Bay Blizzard (May 19). Once again this season, all Iowa Barnstormers home games will be played at Wells Fargo Arena in downtown Des Moines, Iowa. A complete 2019 schedule is attached. The Iowa Barnstormers 2019 promotional schedule will be released soon. Season Tickets are on sale for the Iowa Barnstormers 2019 season starting as low as $80 per seat. Don’t miss a minute of the action this season! For more information, call the Barnstormers at (515) 633-2255 or log on to www.theiowabarnstormers.com.